Wilderness Guide and Survival Instructor, Frank Grindrod has been dedicated to teaching earth skills since founding Earthwork Programs in 1999. Some of his focuses include nature awareness, tracking, wilderness living skills and earth philosophy. He is a graduate of Greenfield Community College’s nationally-recognized Outdoor Leadership Program. Frank maintains his own education studying with respected mentors; Tom Brown, Jon Young, Paul Rezendes and others. He has been trained as a Wilderness First Responder and is a certified facilitator for the Nurtured Heart Approach. As an Advance Trainer of the Nurtured Heart Approach, Frank has studied with national trainers including Gabrielli Lachiara, LSW., Lisa Bravo, Tom Grove and Howard Glasser, MA. He is recognized as an advanced trainer and coach with energy parenting and Howard Glasser’s, The Inner Wealth Initiative and the Children’s Success Foundation. Frank is currently working as a professor at Smith College, a lead facilitator of wilderness education programs and the Nurtured Heart Approach, as well as consulting for camps, museums, conferences, schools and environmental education centers throughout New England. Mors has been a part of the Earthwork community for almost decade, working alongside director Frank Grindrod in a variety of programs. Mors’ extensive work in outdoor education, survival and wilderness living has granted him recognition as one of the world’s foremost authorities on Boreal wilderness skills and survival. In his life, Mors popularized the term ‘bushcraft’ in the Northern Hemisphere after publishing his first book Bushcraft, in 1988 and coined the familiar saying “the more you know, the less you carry.” He is a resident of Peers, Alberta, where he has lived and worked for the past 45 years. As an educator, Kochanski was an outdoor education instructor at the University of Alberta for 25 years. He still participates as a Master Instructor with Karamat Wilderness Ways and has been involved with the Junior Forest Warden Program for the last 30 years inspiring wardens and leaders. He received the JFW Lifetime Achievement Award in 2008. Dr. Larry Buell is founder and director of Earthlands, and Earth-centered intentional community and ecological study center and the University of the Wild, an alternative higher education curriculum. He has been a friend and mentor to Frank Grindrod and Earthwork Programs for over twenty years. He established and formerly directed the internationally recognized Outdoor Leadership Program at Greenfield Community College, MA. Larry received his B.S. from Springfield College, his Master’s Degree in Outdoor Education from Penn State University, and his Doctorate from the University of Massachusetts/Amherst. Buell serves on the Alumni Committee to Divest UMass from Fossil Fuels. He is consultant to numerous schools, colleges, universities, and community agencies. Larry frequently provides workshops and addresses regional and national conferences. He has an extensive background in international travel and work study. He is author of The Outdoor Leadership Competency Manual; The 24-Hour Experience: An Outdoor Adventure Program; Human Ecology: Roots of Our Worldview and Foundations for a Sustainable Future; and Return to the Meadow: Poetry, Prose, and Images of Place. Larry lives with his wife on the original 1733 Buell Homestead in Petersham, MA. Barry Keegan has been a mentor and friend to Frank for the past 15 years. Barry has taught many Earth skills since 1991: such as flint knapping, basketry, bark canoe making, fire by friction, bows and arrows, primitive fishing, survival food/water/shelter, and much more, has made or repaired 70 wigwams and longhouses of bark and thatch, and 15 dugout canoes, one of 17 feet by 3 ft. , has been part of numerous films including History Channel’s Stonehenge Archer (Mystery Quest), and performs a rare demonstration of 9 ways to make fire by friction-back-to-back. He has taught at many survival schools, primitive gatherings, colleges and public schools, day camps, museum and nature centers. He also makes replica crafts for many museums and teaching institutions, has written over 20 articles for periodicals and assisted in writing and illustrating numerous books on primitive technology related matters. As the owner of the Jack Mountain Bushcraft School, Tim has worked with Frank Grindrod and Earthwork Programs in various capacities over the past 15 years. From a young age Tim was camping, fishing and learning how to get around in a canoe. After earning an undergraduate degree, he fulfilled a childhood dream and moved to Alaska where he fished and lived for a year in a 12-foot trailer before returning to the lower 48 and getting a masters degree in education. Tim spent years learning the craft of guiding and traditions of the north woods from Master Maine Guide Raymond Reitze and studied extensively with Mors Kochanski. He spent significant time in both summer and winter traveling with and learning from native Cree people in northern Quebec. Tim taught bushcraft and guided part-time for several years before founding the Jack Mountain Bushcraft School in 1999. He’s been at it full-time since then. Tim has taught 39 college-accredited bushcraft semester courses. He has guided survival, canoe, snowshoe, fishing and hiking trips in Maine, New Hampshire, Quebec, New Brunswick, Alaska and Florida. Tim has written seven books and a variety of magazine and newspaper articles including, The Woods Cook: Outdoor Cooking With A Professional Guide, Bushcraft Education: Riffs And Reflections On Teaching And Learning Outdoors, and On The Trail: Selected Canoe And Snowshoe Trip Journals. Tim has consulted on several television shows on both sides of the camera, including, Naked & Afraid and Man Vs. Wild with Bear Grylls. Lenore is the owner of Natural Vitality in Northampton, MA, where she offers Holistic Health Consultations and Integrated Bodywork therapies. She is a graduate of the Rocky Mountain Center for Botanical Studies in Boulder, CO, where she completed three years of training in Clinical Herbalism. She is a Licensed Massage Therapist specializing in deep tissue, acupressure and craniosacral therapies. Lenore is certified in raw food preparation through the Living Light Culinary Art Institute and Rawbert’s Organic Cafe. She has completed many years of trainings, apprenticeships and classes in Herbalism, Shamanism and Chinese Five Element Acupressure. Lenore offers cleansing, detox and weight-loss programs, medicinal plant walks, and seasonal health and healing retreats. Elyssa is called to service by a truth spoken through the words of angel Kyodo williams, who says, “Without inner change, no change is possible. Without outer change, no change matters.” She believes all cultures of people have their own unique gifts to share in the cultural awakening of our times, and that we are all needed to care for our planet and the living systems she supports. Elyssa shines as a bridger and weaver of community, as a link across sectors and geographies. 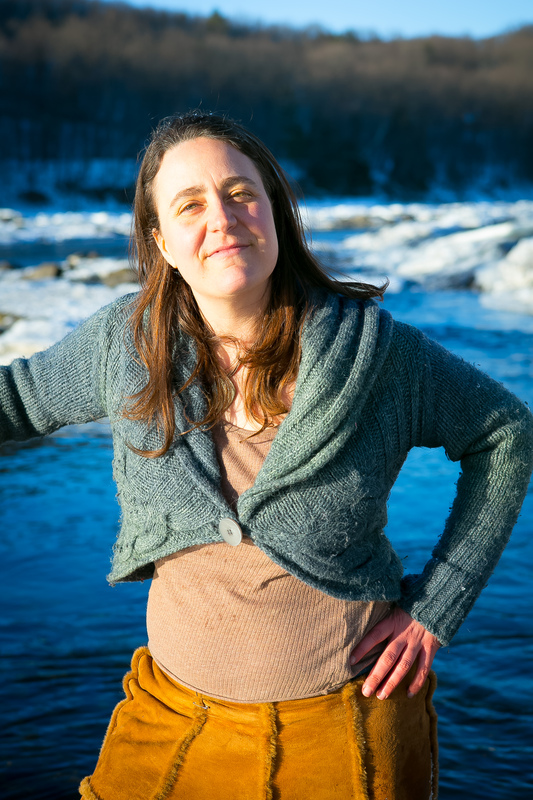 She enjoys deep connection to place through nature-based mentoring, homesteading, wildcrafting, foraging and community potlucks. She also enjoys sharing the gifts that have helped her on her inner journey, including practice in Non-violent communication, Restorative Circles, yoga, dance, and those awkward conversations everyone is eventually glad they’ve had. Elyssa is a third generation Italian-American who calls home a little island at the base of the Great Falls of the Kwanitekwe (‘long tidal river’) or Connecticut River, land once held by the Abenaki people, who still walk among us. Whether the Andes, or the Alps; the Alaskan or the Appalachian, our adventure guide Anthony would love to show you his favorite peaks. His involvement in outdoor leadership began at a young age and has had a tremendous impact on his life. After some time spent pursuing a conventional education here in Massachusetts, he set out to explore the world; finding himself sharing his skills in such settings as guiding treks through indigenous communities in Bolivia, and tracking the great Patagonian Puma through remote nature reserves in Southern Chile. Anthony’s photography and field notes have been published in travel guide magazines to aid adventurous hikers through iconic trails in Patagonia. He’ll be sharing his knowledge of exotic wildernesses and native cultures around the world on our upcoming expeditions! As a qualified team of inspirational instructors, we continue to teach in a variety of settings, including outdoors, workshops, conferences, environmental education centers, and public and private schools. In keeping with the mentoring tradition, we may also invite guest instructors and assistants to join our team.